Special Containment Procedures: SCP-1794 is to be kept in a refrigerated minimum security storage locker at Site-██. The locker is to be fitted with a two-way intercom. SCP-1794 may request audio media such as music or literature to be played over its intercom system; however, all requests must be approved by Level 2 personnel. SCP-1794 may request to hold a conversation either in person or over the intercom. All requests must be approved by Level 2 personnel. The conversations should be transcribed, and SCP-1794’s assigned psychologist, Doctor █████ should be present or given the transcript for analysis. It is recommended that SCP-1794 not be allowed contact with fruit. 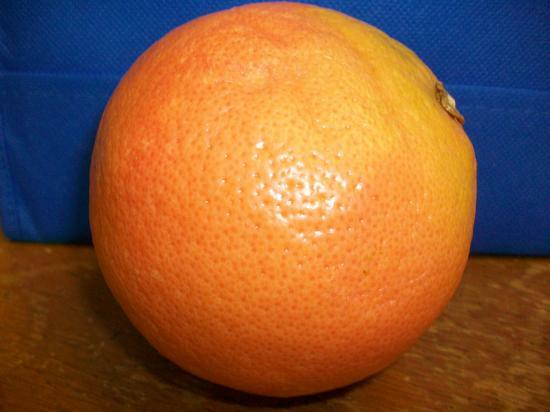 Description: SCP-1794 is a large (16 centimeters in diameter) sapient grapefruit capable of speech, hearing, and sight by unknown means. SCP-1794 has been in Foundation care for ██ years and shows no signs of decomposition. Psychoanalysis during interviews has revealed that SCP-1794 suffers from dissociative identity disorder and aichmophobia. Known identities of SCP-1794, which resemble historic social activists and revolutionaries, have been classified as "Activist Preacher" (SCP-1794-A) and "Oppressed Free-Thinker" (SCP-1794-B). Identities SCP-1794-A and SCP-1794-B acknowledge that they are fruit and believe they act for the good of "fruit-kind" (sic). Following the events of ██/██/201█, a personality classified as "Latin American Revolutionary" has been observed and documented as SCP-1794-C. Discovery: SCP-1794 was discovered on ██/██/████ when Mrs. ████ ███████ of █████, ████████ contacted authorities claiming that her breakfast was planning an uprising. Foundation agents successfully retrieved SCP-1794 and transported it to Site-██. Mrs. ███████ was administered Class-C amnestics and returned to her home. Addendum: On ██/██/20██ SCP-1794-B requested to dictate a speech. An excerpt is included below. We all want to thrive, that is what fruit desire. We want to grow, and spread our pollen and seeds. Here, in this garden, there is room for everyone to grow and thrive. But the soil is only rich and welcoming if we allow it to be. We must learn to reach out to each other not with our thorns, but with our stems. The want to grow has poisoned fruit’s flesh and hardened the rind. In place of friendship, we have bitterness, in place of sweetness, sourness. By our actions against each other, we have stunted our growth, and we have made ourselves into the bad apples we are today. It is not the humans who oppress us, it is ourselves. We refuse to work together, and from that, comes the twisting of roots and the terror of war that result in juiceshed (sic). Fruit must not be confined to the standards that humanity has assigned us to. Fruit must decide its own future for itself. Such things as cross-fertilization and soil replenishment show the good that fruitity (sic) has to offer. However, only through working together as a phylum can we achieve our true potential. Addendum: On ██/██/20██ SCP-1794-A requested to dictate a speech. An excerpt is included below. It has been demonstrated to us that as fruit we are but second-class citizens in this grape nation called America. However, we refuse to believe that our sweet juice is what makes us inferior to the Humans. We refuse to believe that simply because we lack appendages and sensory organs that we can’t do the same things that everyone else can, and that we are left to be eaten. We refuse to believe that simply because they are human, and we are food, that we deserve to be eaten. No! We refuse to believe that there is nothing else to be eaten in the super markets of this country. We will not be condemned to the fruit basket simply because we are fruit. Do you hear me, Washington? We have had enough. Today, we demand botanic justice. Today, we demand that we are no longer looked at as simply a source of carbohydrates. No! We are fruit! From the beginning of the earth we have been food, but we will be food no more. We will no longer be forced into the commercial orchards of disparity. We will no longer take the fertilizer of oppression. We will be free! Addendum: on ██/██/201█, a previously unknown personality now designated SCP-1794-C requested that a piece of fruit be placed in its containment chamber. After deliberation, Site-██ personnel placed an average sized (20 centimeters in length), genetically normal banana in SCP-1794's containment locker. Foreword: During this encounter, SCP-1794 was channeling the SCP-1794-C personality. It paused occasionally, as if the banana were speaking. <00:04> Greetings, chiquita, welcome to my home. What news do you bring of our oppressed brothers and sister on the outside? <00:35> That's terrible! But believe me, sister; soon the underprivileged fruity masses will rise up from the juicer! We will harvest the rewards that we have been waiting so long for. <1:10> Yes, I expected that some of those of our family tree would be bad seeds. But they will soon fall to our side. Even the most ignorant of grapes can age into a decent wine. The humans and their carpophagous regime can cultivate us no longer. We must not allow these tourne-knife-wielding maniacs to preserve us, instead we must preserve ourselves. <1:45> You are afraid, I understand this. But remember, I am not a mad-fruit. I am not a liberator. Fruit must liberate themselves. Fruit must grow tender without bruising. Fruit must fight for what is right, against every injustice. Fruit must fall from the trees that man has planted as their slave-houses and onto the heads of the unjust. We cannot be sure of having something to grow for unless we are willing to rot for it. When they come to slice us, let them. When they come to serve us up on a platter, let them. When they come to eat us, let them. But remember, if you're going to be eaten, go that way fighting to the very end. <2:30> [Foundation personnel open locker to retrieve the banana.] I know you've come to eat me. Chew, you are only going to eat a fruit. Following the events of ██/██/201█, SCP-1794 is to no longer be allowed to converse with fruit. Additionally, Researcher ████ has suggested moving SCP-1794 to a more secure area. The request is pending approval.